Add warm and sweet vanilla flavor to your cakes, cookies, and pastries using Shank's 8 oz. white imitation vanilla flavoring. It's also great for making sauces, frostings, and flavored drinks! In contrast to pure vanilla extract that has a naturally dark color, this imitation vanilla is clear. It's just what your bakery needs in order to make brilliantly bright white vanilla frostings. Now, you'll be able to add great vanilla flavor without imparting any additional color to your sweet treats! Besides baking applications, try using a dash of vanilla flavor with smoothies, coffees, puddings, chocolates, or other confections. This imitation vanilla extract is gluten free, so it can be used to create mouthwatering gluten free baked goods and other flavorful menu items that all of your guests can enjoy. First thing I noticed is this does not have that fake vanilla/alcohol smell. Secondly, it is clear and therefore fantastic for buttercream and royal icings. Third, it's a great price! The only reason it doesn't get 5 stars is because the taste is so minimal that you need a large amount to be able to taste it which in return negatively affects the consistency of icing. Smells good and taste great. There really is no different when you use imitation vanilla to bake so I always use this when I make a batch of cookies. This vanilla has a surprising flavor which has undertones of other flavours. When I use this vanilla in cakes, I like to pair it with lemon juice as I do believe the two work harmoniously together. The only downside is you need to use a good bit of this vanilla to notice it in the cake batter, prior to baking. Still a good product. Very good tasting vanilla. No chemical after taste, and is it crystal clear, so is not to tint buttercream. I did find the overall flavor to be a bit mild. Not as strong as other clear vanillas I have used. Still, a very nice product. A great tasting white vanilla. It's a nice strong flavor that doesn't taste fake at all. I like buying this small bottle to keep in my spice cabinet and refill it with the bigger bottle sold here too. Love this vanilla extract! I just wish it came in a 16oz size because I go through it quite fast (but not enough to need 32oz). Perfect for vanilla cupcakes and buttercream where I want the baked goods to be as white as possible. This is not vanilla extract, but it works well for baked goods by not losing its strength when heat is applied. It works great in white cakes or icing by not leaving a Brown cast. This is much cheaper than I can by elsewhere. I will order again. Top notch product for those times where dark vanilla will discolor your items, like white cakes and frostings. Good vanilla flavor, at an economical price. Excellent white imitation vanilla for an unbeatable price. It has a clean vanilla smell and flavor. What I particularly like is that its base is a sugar syrup (water/sugar) with small amount of alcohol as a preservative whereas most imitation vanilla's are nearly all alcohol. The sugar/water syrup base gives it a cleaner taste profile and in my opinion also allows it to better disperse in your dessert creation more evenly than alcohol based. when making old fashioned classic birthday cakes, this clear / white vanilla is a must. it's not always easy to locate, so finding it here was a real bonus. the container will last a long time and is a great price. 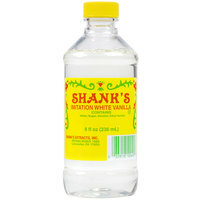 The Shank's white imitation vanilla is a great flavoring to use when are making our clean white wedding frosting. A great taste without the unsightly appearance of vanilla bean specks. This is the best tasting vanilla. It makes my buttercream icing superb! I will definitely order it again but in a bigger bottle next time. I was tasked with creating a "perfectly white" vanilla cake. I was happy to see that this vanilla was available. While it is imitation vanilla, that taste is almost exactly like pure. It is totally clear and it allows me to creat the cake with out the tint of traditional vanilla extrac. This vanilla extract is terrific. All the flavor of real vanilla extract without the dark color. Use this in your cake mixes and still get that white looking cake and batter everytime! I use the Shark’s eight ounce bottle of white imitation vanilla on a regular basis. I have an in-house baker and this is his go to vanilla flavoring. He likes that the flavor stays true at high temperatures and has a good shelf life. And I always appreciate the positive sincere feedback from our cake customers. I would recommend. I always try to use real vanilla when possible but when I need my buttercream to be bright white I use white or clear vanilla. This has a good vanilla flavor without being too artificial tasting. It is always great to have white imitation vanilla on hand at our bakery. The white vanilla has a great flavor and is perfect for keeping the bright white of our cakes and frostings. Real vanilla or imitation vanilla that is dark, can cause a stained looked in white frostings. I know people hate on imitation vanilla all the time, but personally, I like how this vanilla smells. It doesn't have the caramelized undertones that the darker vanillas have (imitation or real extract), but for certain applications that's actually a good thing. For one, I think it pairs better with lemon, because it's a cleaner, purer vanilla flavor (dark vanillas smell like caramel or brown sugar to me, in addition to vanilla - great for chocolate chip cookies, but not as ideal for lemony desserts). It reminds me of cream soda vanilla flavor. I wouldn't use it instead of dark vanilla for every application, but for certain ones I definitely prefer it. The flavor isn't very strong. You need to use quite a bit to get decent flavor. However, this works nicely for royal icing, as it doesn't discolor your icing. Good flavor despite being imitation. It is clear so it won't darken light colored bakery items. large size lasts a long time and retains its flavor. White imitation vanilla is the the best way to use for white cake and this product is good. Flavor of vanilla is intense too. Highly recommend. Clear vanilla extract that is perfect when you need pure white frosting but still need to add a vanilla taste. This bottle is inexpensive so give it a shot. We have been using several different vanilla flavorings, decided to test this one. Love it. Its imitation, but for icing, I couldnt tell a difference and the clear allows the icing to be white, which really helps with presentation. Have been very pleased with the flavor of this vanilla. Love that it is clear! It adds great flavor to buttercream frosting without tinting it. Overall happy with this product. We use it in buttercream frosting and fresh whipped cream. The clear color was just what we needed to avoid Turing them that off white color. This has good flavor and is well priced. It's clear color helps not to tint the whitest of creations. No need for maybe use the white food coloring when using this. I use this imitation vanilla extract in my baked goods, especially when I don't want brown color of regular vanilla extract tinting my white cakes. Works great for that purpose, and is much cheaper too. good flavor and works well when need to get great tasting icing without wanted to yellow the color of the product. works great with buttercream and royal icings. Clear vanilla is great for white cakes. It can be expensive and there are few brand options in the store, so this is a good value. Used this Shank's 8 oz. White Imitation Vanilla for the white icing on my Red Velvet Cake this weekend and it turned out great and perfect white icing! I only use a clean vanilla in my icing. This is a much cheaper alternative to the brand I've been loyal to for years. I will probably buy this product again in the larger size now that I know I like it. I love using this imitation vanilla specially when making cream cheese frosting because you want to clean white frosting is that a bad tinted brown frosting if you were to use pure vanilla extract so it comes in handy when you need back clean white frosting. I love this vanilla for all my white icings and white cake flavor needs. The flavor is very nice without being chemically! You can't beat the price! this is the classic taste of clear vanilla - key to classic recipes and baked goods where the clear color is key. it's got that flavor that is associated with childhood and desserts that need that taste profile benefit from it! Although nothing can beat pure vanilla extract, this is a very good brand of imitation vanilla! As others had stated, I keep imitation vanilla for times when I need my butter cream to be really white. This adds a nice flavor but no color. Great price too. Would buy again! Really good vanilla flavor without adding darker color to cakes and icings. Ideal when you want to get a really pure white cake or frosting. Great vanilla!! For not wanting to add color to frostings. Helps me achieve pure white color for my buttercream. I will buy again in the future.